Fire Protection Companies. Commercial Fire Alarm Systems. Commercial Fire Sprinkler Systems. Unpredictable and costly, commercial fires are a severe threat to businesses. When you don’t have substantial fire protection and safety plan, your property, and most importantly, the lives of your employees and customers are at risk. As a property manager or business owner, it is your responsibility to keep your building occupants protected during the times they are on the premises. A good fire protection plan will ensure that you don’t rely on a sole method for defense against fire. 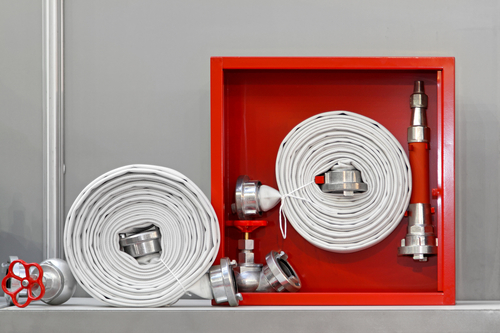 A balanced fire protection plan should have various fire defense equipment such as fire hose systems. Commercial establishments depend on sprinklers to add to their building defense plan. However, a better fire protection option would be to rely on a standpipe hose station. This system is a combination of a fire hose rack, a nozzle, and a valve. The standard requirements for a commercial building to have a standpipe hose system are stipulated within the building code jurisdiction where the establishment falls under. In many US states and cities, they adopt what’s under the International Building Code (IBC), but with modifications based on their jurisdictions. If a building doesn’t contain any of these requirements, they are not allowed to have a standpipe system installation. Open the valve all the way. Pull the hose completely off the rack. Open the nozzle to release the water. One of the main advantages of a standpipe hose station is that it will give you 100% dependability. This trait is a solid part of a fire protection and safety plan. A fire hose installed within a standpipe station can also lessen water damage. You can release water directly to the fire source, as opposed to random sprays from automatic sprinklers. Also, the system can be turned off right away after the fire has been extinguished. During a fire emergency, evacuating the building is not always an immediate option. If there is a standpipe hose station within the premises, you can clear a path for the building occupants. A physical inspection should regularly be conducted to check if the fire hose has no signs of rot, debris, mildew, or damage by cuts, chemicals, burns, or even critters. The interior of the fire hose should also be checked for any signs of liner damage. If it shows any delamination, the tube should not be used anymore. An effective way of washing and drying the fire hose will depend on what type of particles and debris are stuck on the hose. However, here are the necessary steps that should be followed. The hose should be cleaned after each use. Wash the hose if dirt cannot be thoroughly cleaned from the hose or if it has come in contact with harmful materials. If during the use it has been exposed to hazardous materials, it should be decontaminated. A covered fire hose should be wiped dry. Never dry a hose under harsh sunlight or hot pavement. © 2014-2019 Commercial Fire Sprinkler Systems Business Solutions. All Rights Reserved.